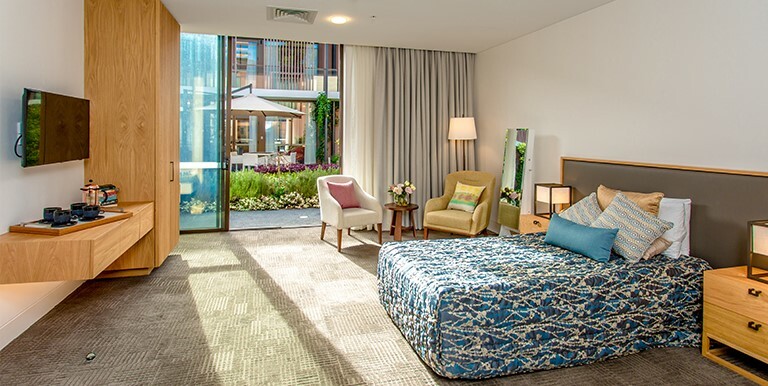 Bella Vista Gardens, our state of the art aged care residence at Kellyville, in The Hills Shire, north west of Sydney is now open. Idyllically located overlooking the picturesque Castle Hill Country Club Golf Course, this modern aged care residence features exceptional design quality and architectural excellence within a warm and welcoming environment. Bella Vista Gardens provides residents with the full spectrum of care and services including dementia care, extra services, respite care and palliative care. For residents’ physical, emotional and social wellbeing, Bella Vista Gardens offers lifestyle services tailored to residents’ needs including physiotherapy, aquatic physiotherapy, leisure and lifestyle activities, music therapy and individualised service offerings. Bella Vista Gardens suites feature private ensuite bathrooms and sitting areas, with many including kitchenettes and some featuring balconies or direct garden access. Each suite has been designed to be spacious, light filled and are stylishly appointed with custom designed furnishings. Residents have a selection of beautifully appointed lounge areas and intimate dining rooms to choose from. An architecturally landscaped Village Green, manicured gardens, function rooms, Reflections Wellness Centre with beauty salon and hairdresser, hydrotherapy pool/spa, gymnasium and exercise facilities are all available on site.